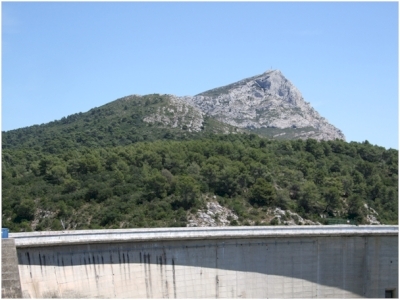 Montagne Sainte-Victoire et sites cezaniens is part of the Tentative list of France in order to qualify for inclusion in the World Heritage List. From this serial nomination, I visited the atelier of Paul Cezanne not far from the historical center of Aix-en-Provence, and also climbed the Montagne Sainte-Victoire (photo), in July 2011. The mountain is really impresive, and no wonder that it was a favourite subject of Cezanne. It is formed by a massive limestone rock covered by typical mediterraen vegetation with the iron cross on the top. The atelier of Cezanne was quite a touristy place, and you can visit it in the former house of Cezanne surrounded by rather neglected garden (in 2011). Though I enjoyed my trip to the summit of Montagne Sainte-Victoire and love works of Cezanne, I cannot see any OUV here. The nomination text is a bit confusing to me with quite a broad target spanning from dinosaur eggs to Cezanne, and the main reason for inscription is to protect the sites against the tourist industry. I guess it has no chance to enter the list. However, I would strongly recommend visiting historic center of Aix that is stuffed by very nice monuments such as cathedral. Aix is not far from Marseille and it is worth-visiting even in the case you do not like both modern art and climbing limestone cliffs.